When wine started flowing through taps in dozens of homes during an Italian grape festival it was hailed as a miracle but now it has emerged it was more bad plumbing than religion. 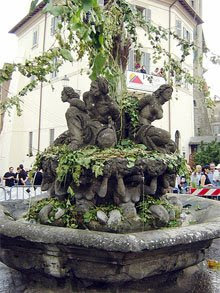 The free sparkling chilled white wine was supposed to supply the fountain in the town's square, as part of the event at the annual Marino Grape Festival. However, due to a technical error, the pipes from the local vineyard which supply the marble fountain were switched to the domestic supply feeding homes at Marino, in the famous wine-making Alban Hills, south of Rome. So when mayor Adriano Palozzi, a priest and locals gathered round the fountain following a prayer of thanks to the Virgin Mary, with plastic glasses at the ready for Marino DOC they were left disappointed as instead of fresh wine, out poured the usual water. Then came the shout of "miracolo" from one house overlooking the square and a local rushed out onto her balcony to reveal that wine was flowing from her kitchen tap. On Tuesday the workmen were fixing the problem while the event was the talk of the town - one local named as Anna said: "I was in the kitchen ready to do the housework and filled up a bucket with water. "I was going to mop the floor with it but I immediately noticed a sweet smell from the tap and it was also slightly yellow - I recognised instantly it was wine. "I called my neighbours and they turned on their taps and it was the same - the word quickly spread and everyone filled up bottles and plastic containers with the wine. "It all happened at the same time as Sagra dell Uva Grape Festival so everyone thought it was a miracle - I don't think that the mayor and the other officials were very happy though." Mayor Palozzi said: "It was a surprise and completely unexpected - workmen are fixing the problem which obviously came about through a technical error. "Several houses have been affected and people were calling it a miracle which it wasn't - it was a mistake. I don't think it dampened the enthusiasm of people at the festival and everyone still had a good time." The Sagra dell Uva commemorates the return of admiral Marcantonio Colonna to his hometown of Marino following his famous victory over the Turks at the Battle of Lepanto in October 1571. The town sent more than 250 sailors to the battle and the Sagra is celebrated every October to give thanks for their safe return. One man's mistake is another man's surprise, is another man's miracle. A chain reaction that keeps on giving misery or joy, depending on who you are and how you receive it. As for me, if wine flowed from my facet at home, I would immediately bottle it up as "Sagra Sanctified Miracle Wine" and sell it to tourists. I know that these posts usually flow with Ale Stories, but occasionally an interesting wine or spirits story miraculously pops up that’s worth drinking in. What amused me was, the spurious excuse they are still stretching out, ( One small campaign battle nearly 500 years ago ) so they could have an annual shindig. Well now, there you go. You write the "365 Commemorative Nights of Drinking" book. Then you create a special coaster set (your own artwork, of course) with a set of coasters for each day. For example -- today is John Lennon's Birthday. That should be reason enough to celebrate.